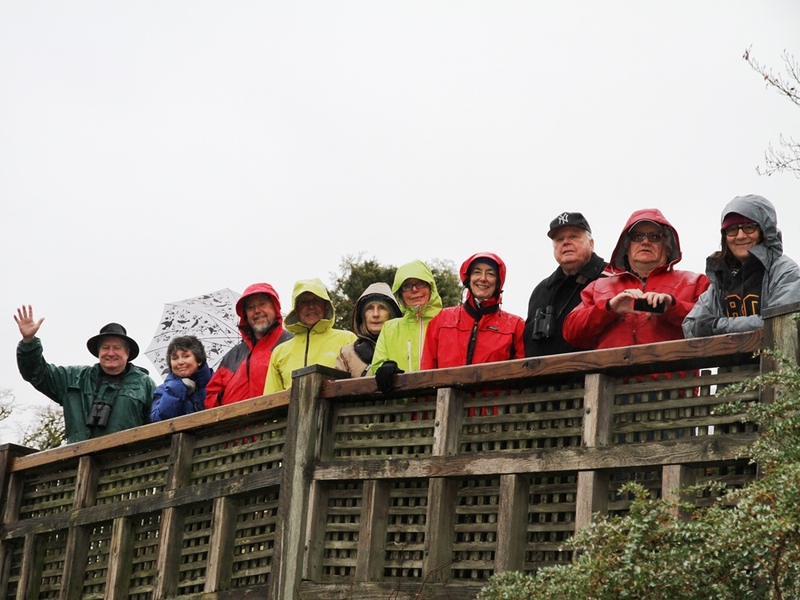 On a lousy, rainy Tuesday morning, eleven weirdo DNCBers tramped around Queen Elizabeth Park, saw very few species, and got soaked. However, it was dry and warm in the Bloedel Conservatory where we enjoyed many exotic world species. Check out the photo evidence (soon) on our DNCB Picasa site. Four of us (Mike B drove Mary T, PB Lorna and me) met at Petra’s and drove through the heavy rush hour traffic to downtown Vancouver. 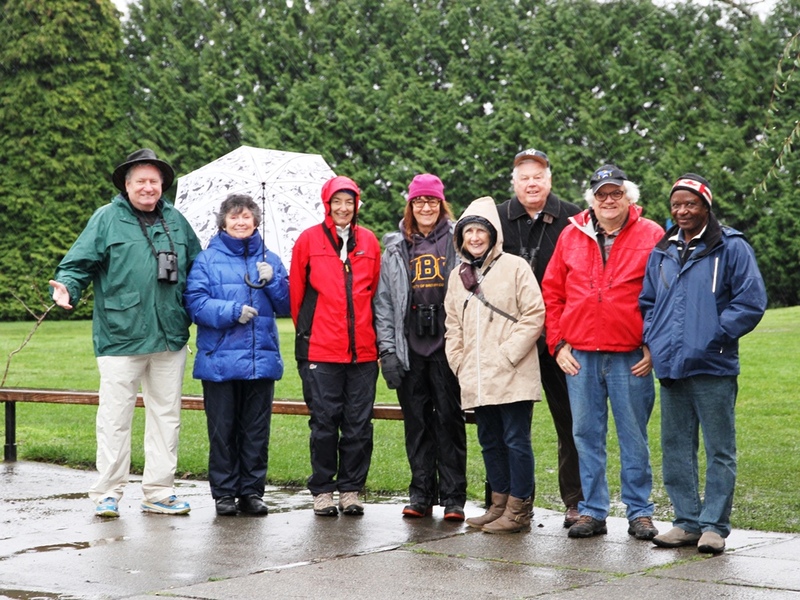 We arrived around 9:00 a.m. at the QE Park Golf Course where Aussie Nance, Chris McV and Jonathan & Lorraine met us. Stormcat Paula, Roy and Gordon arrived shortly thereafter in their fisherman rain gear. After 15 minutes of birding, I finally heard a Chickadee. Jonathan took a Group Photo at the Golf Course entrance, then another on a Bridge overlooking the pristine “pit”. Many buds, and blossoms (Cherry Trees) were out and surprisingly so were some beautiful flowers, including a couple of Bougainvillea plants in full bloom. Some trees were wrapped in glue tape to try to retard a bug infestation. Albeit, no real interesting bird sightings. Mary T got excited with a few Golden-crowned Kinglets, a Raven and some Anna’s Hummingbirds. Nance found a very old Owl pellet, but no owl. The pond had a few American Wigeon, Mallards, a Gadwall pair, and some seemingly-small Canada Geese. After wandering around in a daze for an hour or so, we decided to visit the warm, dry Bloedel Observatory. Mike B was ecstatic that we got not only the Seniors, but also a Group deal on the entrance price. The Photo Guide folder helped with identification of the many gorgeous, exotic species, but there seemed to be many other species (including lots of mice) not included in the Guide. More than 200 birds, mostly free-flying and nesting, including Finches, Parrots and Macaws, a couple of which spoke more sense than some DNCBers. Some of us relaxed in the Healing Garden where “We gain positive effects on our emotional, mental, physical, spiritual, and social well-being from being exposed to nature” (I learned this from last night’s Speaker, Nancy Prober, at our Delta Nats meeting. Also, it’s a quote on the Bloedel website). Approaching Noon, we (Jonathan & Lorraine, Mike B, PB Lorna, Mary T and me; we lost Stormcat and her guardians Gordon & Roy) left the Observatory and drove to Main Street in search of a Pub. The Main Street Pub at 33rd Street was perfect, and my Lamb Chops Special was delicious, washed down with a couple of Red Truck Lagers. A very pleasant drive back to Tsawwassen; I dozed off through the drivel between Mike and the two “chicks” in the back. Another very different, but nonetheless enjoyable DNCB outing. Next Wednesday, March 9, is our quarterly Birds on the Bay outing in Boundary Bay Regional Park (BBRP). We will meet at and leave from historic Cammidge House at 9:00 a.m. Also, we will start our Bird Nest Box cleaning & closing this Thursday, March 3 at 9:30 a.m. at the 12th Street entrance to BBRP. This entry was posted in *DNCB, Bloedel Conservatory, Queen Elizabeth Park. Bookmark the permalink.